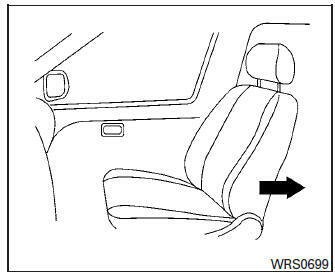 For additional information on installing a booster seat in your vehicle, follow the instructions outlined in this section. Make sure the shoulder portion of the belt is away from the child’s face and neck and the lap portion of the belt does not cross the stomach. Make sure the shoulder belt is not behind the child or under the child’s arm. A booster seat must only be installed in a seating position that has a lap/shoulder belt. Choose only a booster seat with a label certifying that it complies with Canadian Motor Vehicle Safety Standard 213. Check the booster seat in your vehicle to be sure it is compatible with the vehicle’s seat and seat belt system. Make sure the child’s head will be properly supported by the booster seat or vehicle seat. The seatback must be at or above the center of the child’s ears. For example, if a low back booster seat is chosen, the vehicle seatback must be at or above the center of the child’s ears. If the seatback is lower than the center of the child’s ears, a high back booster seat should be used. If the booster seat is compatible with your vehicle, place the child in the booster seat and check the various adjustments to be sure the booster seat is compatible with the child. Always follow all recommended procedures. All Canadian provinces or territories require that infants and small children be restrained in an approved child restraint at all times while the vehicle is being operated. 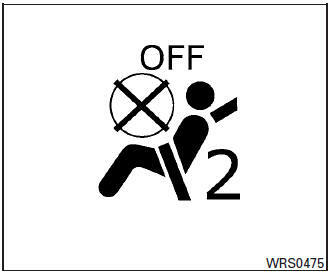 The instructions in this section apply to booster seat installation in the rear seats or the front passenger seat. WARNING To avoid injury to child, do not use the lap/shoulder belt in the Automatic Locking Retractor (ALR) mode when using a booster seat with the seat belts. For additional information, refer to all Warnings and Cautions in the “Child safety”, “Child restraints” and “Booster seats” sections of this manual before installing a child restraint. If you must install a booster seat in the front seat, move the seat to the rearmost position. Position the booster seat on the seat. Only place it in a front-facing direction. Always follow the booster seat manufacturer’s instructions. The booster seat should be positioned on the vehicle seat so that it is stable. If necessary, adjust or remove the head restraint/headrest to obtain the correct booster seat fit. If the head restraint/headrest is removed, store it in a secure place. Be sure to reinstall the head restraint/headrest when the booster seat is removed. For additional information about head restraint/headrest adjustment, removal and installation, refer to “Head restraints/headrests” in this section. If the seating position does not have an adjustable head restraint/headrest and it is interfering with the proper booster seat fit, try another seating position or a different booster seat. Position the lap portion of the seat belt low and snug on the child’s hips. Be sure to follow the booster seat manufacturer’s instructions for adjusting the seat belt routing. Pull the shoulder belt portion of the seat belt toward the retractor to take up extra slack. Be sure the shoulder belt is positioned across the top, middle portion of the child’s shoulder. 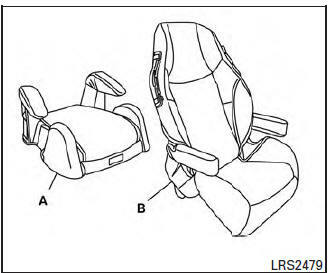 Be sure to follow the booster seat manufacturer’s instructions for adjusting the seat belt routing. Follow the warnings, cautions and instructions for properly fastening a seat belt shown in “Three-point type seat belt with retractor” in this section. illuminate, depending on the size of the child and the type of booster seat being used. For additional information, refer to “Front passenger air bag and status light” in this section.